To learn tips and techniques for my own weight-loss journey, I’ve spoken to tons of experts, dietitians, fitness trainers, and people with personal experience losing weight. But really, I learned the most from two very giggly and often muddy unlikely sources – my own two kids. What I’ve observed from watching their relationship with food and life in general has helped me lose the most weight and keep it off. Here are four tips I hope will help you, too. It’s been so ingrained in me to eat three meals a day and to eat those meals at certain times. Once the clock would strike noon, an alarm would sound off in my brain – must eat lunch! 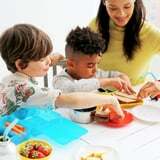 At 11:45, I’d prepare lunch for my kiddos in those cute, four-section trays, and serve it at exactly 12 p.m. I’d call to the kids, “Lunchtime, come and eat!” And countless times they’d say, “We’re not hungry.” Wow. It took me years (my oldest is 6 1/2) to figure this out, to eat only if and when I was hungry, and not eat just because there’s food in front of me or it’s “time to eat.” They’ve reminded it what it means to listen to my body, so it’s OK if lunchtime doesn’t happen exactly at noon. My kids love having tea parties and picnics on the kitchen floor. And one day, my daughter handed me a Peppa Pig bowl and spooned some trail mix into it with a smile. Something clicked for me, about how my bowls and plates are so much bigger, and that means piling more food onto them and eating way more than I need to. I went out and bought some smaller-size bowls and plates (sans Peppa Pig) and when I use them, I feel satisfied but not stuffed. It’s really helped me follow through with eating appropriate portion sizes. Kids are very wiggly and fidgety, and they rarely sit in one place for long, unless there’s a screen involved, of course. When music is on, they dance. When a story is being read, they act it out. They’re always carrying things from here to there, building things, climbing things, and their mode of transportation is either skipping or riding a bike. They’re full of energy and they’re constantly on the move, and it’s something that’s helped me burn up some extra calories. On sleepy mornings, I throw on some Katy Perry or Justin Timberlake to get the kids up and dancing before breakfast. We take a postdinner walk around the neighborhood, and on weekends, we make a point to do something active, whether it’s to hit the indoor trampoline park or go skiing or hiking. But more importantly, I find ways to move more throughout my day when I’m alone, working from home. I hooked my standing desk up to my treadmill, go to the bathroom that’s two flights of stairs up, and do some TRX or ab moves when I need a brain break. Keeping track of the steps I take each day has also motivated some extra movement. At night, instead of plopping myself on the couch watching TV, I try to do a little stretching or strength-training moves on the floor. While brushing my teeth before bed, I do this little two-minute tush-toning workout. Every little bit helps! “Finish your dinner,” I heard coming from my mouth, the same words I remember hearing my own mother say to me. “Why?” my 4-year old asked. 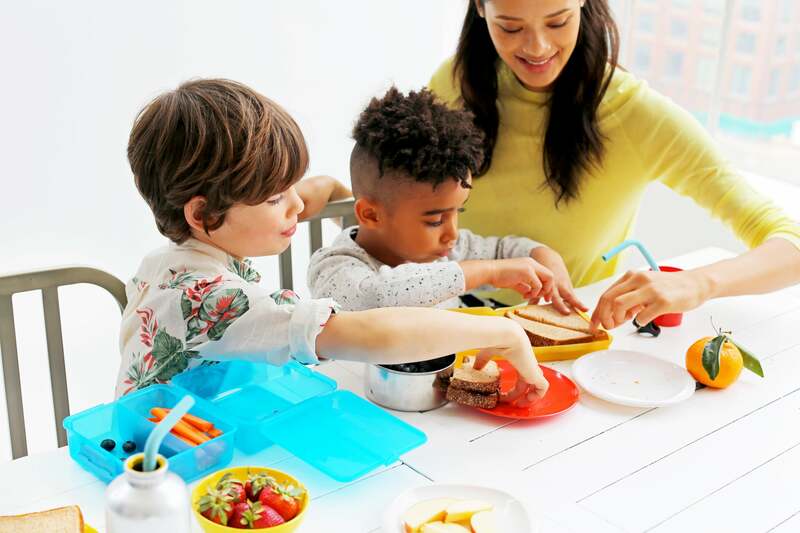 “I’m full.” My husband chimed in and said, “Don’t you want to be part of the clean-plate club?” But what we were both saying went against everything I’ve always told my kids, to listen to their bodies and do what feels right to them. So I abandoned that I idea and now I say, “Eat until you feel like you’re full,” and I follow the same rule too. I give myself an appropriate portion, and try to eat slowly to enjoy (not inhale) my food, and when my stomach feels satisfied, I stop. I put the food away so it doesn’t go to waste, and feel much better not overeating. It helps prevent belly bloat, too.